I’ve been working on so many little projects and have taken a bunch of random photos so I thought I’d collect a few similar things into one post to share my finished objects. Sound like a plan? Typically whenever I see my girlfriend Salina I like to take her a crafty gift because we gift handmade things to each other all the time. You might remember the hat I made for her when we went to New Orleans a while ago. Well, I had the same colorway of the Madlinetosh yarn, Spectrum, in the bulky weight that I had waited forever to do something with for her. So I decided to knit her a cowl. 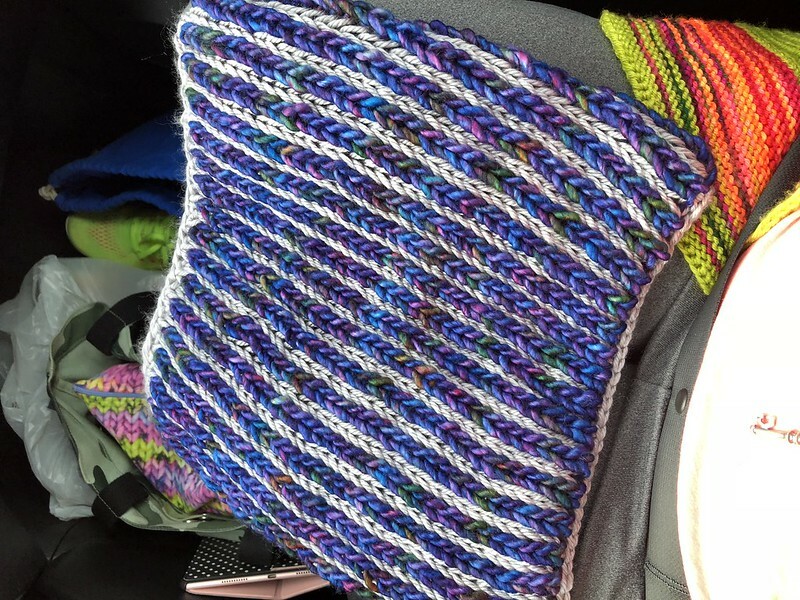 I picked up the Beginners Brioche Cowl when it was free on Ravelry and used it as a guide to knit Salina a two color brioche cowl in the car on the way to Louisville. It only took me a few hours. I cast on more stitches that required to make it a bit bigger and looser and liked the finished look. I used the blue and purple yarn mixed with a skein of Mighty Stitch Bulky in silver. It was a great contrast and insanely soft. And I also decided her daughter Alexandra needed a cowl too but I wanted to do a bolder color palette and a little something different. 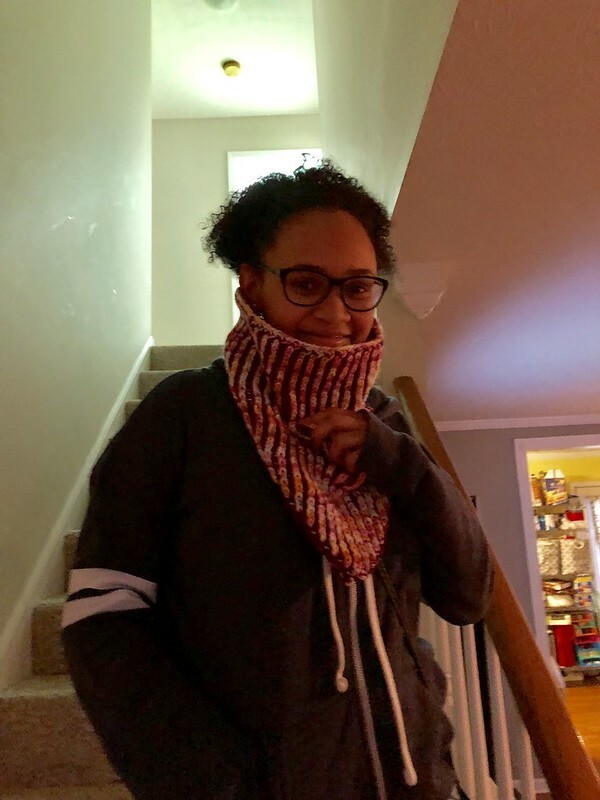 So I made her the fun Worsted Brioche Bandana Cowl and used the leftover yarn I had from my Happy Little Sweater. I love this Indian Corn colorway from the Lemonade Shop and wanted to put what I had left in a fun project. I contrasted it with some Knit Picks Wool of the Andes Superwash in Columbine Heather, a reddish purple, I had in my stash. I think Alexandra will enjoy this little cowl since she’s always cold. 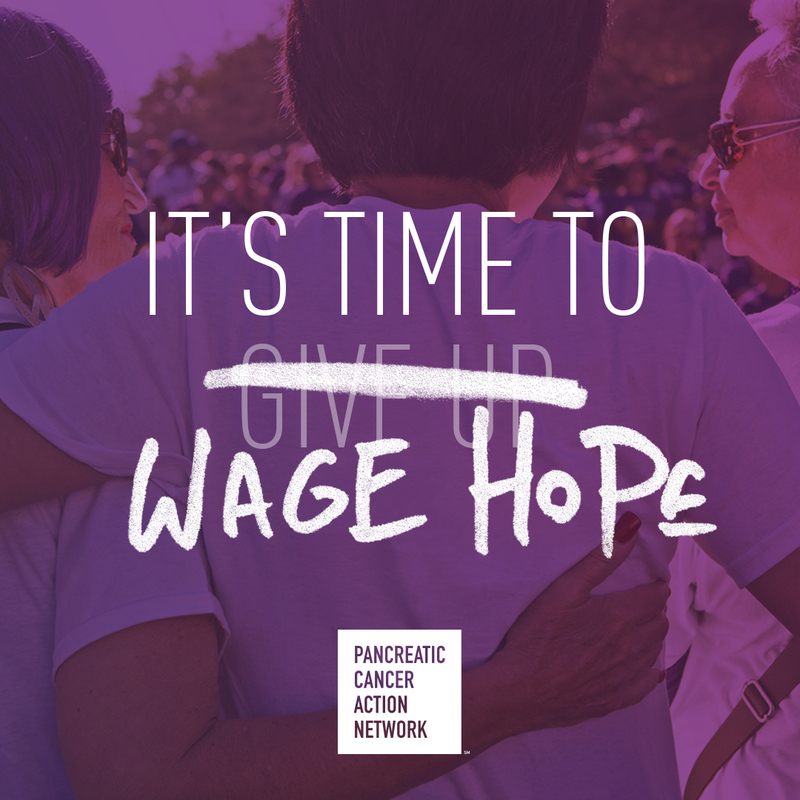 It’s cute to wear with her purple coat or just on its own. And while we were in Louisville, Salina took me to Fiber and Friends a cute little yarn shop in La Grange, Kentucky. The ladies in this shop were so warm and inviting. They were taking my coat off for show and tell so they could see my knits! I definitely suggest if you’re in the area to pop on in. And while we were there Salina fell in love with a pom pom so I suggested she pick out some yarn and I would make her a hat to go with it. She picked up this really beautiful Berroco Millefiori BIG yarn in a purple and blue colorway. 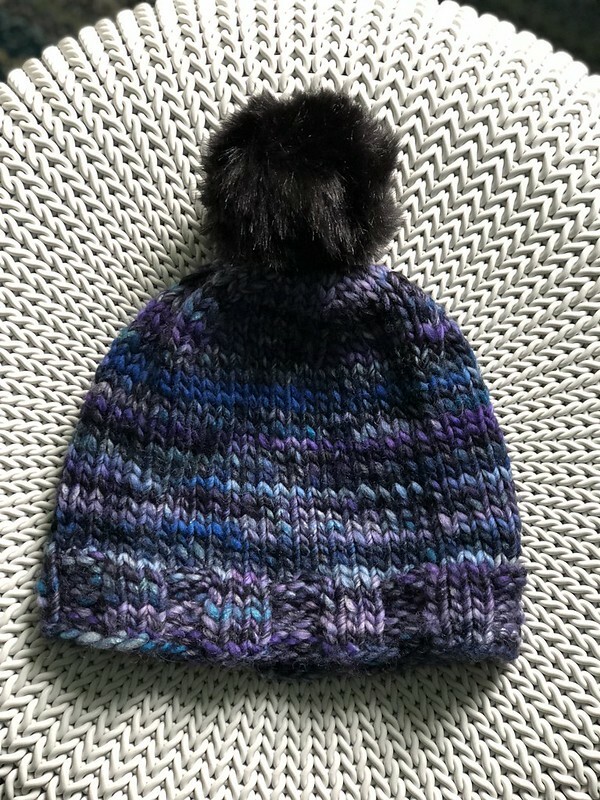 I knew immediately that one skein would be perfect for the Purl Soho pattern Super Soft Merino Hats for Everyone. It doesn’t take much yarn and I was able to whip it up in about 3 hours. I’m so addicted to brioche knitting…you’re going to see these two patterns again very soon. I’ve got some wilder color combos coming that I made for myself! Awesome! I LOVE Alexandra’s cowl colors – GOR – GEEEEEOOOOOUUUUSSSS!!! 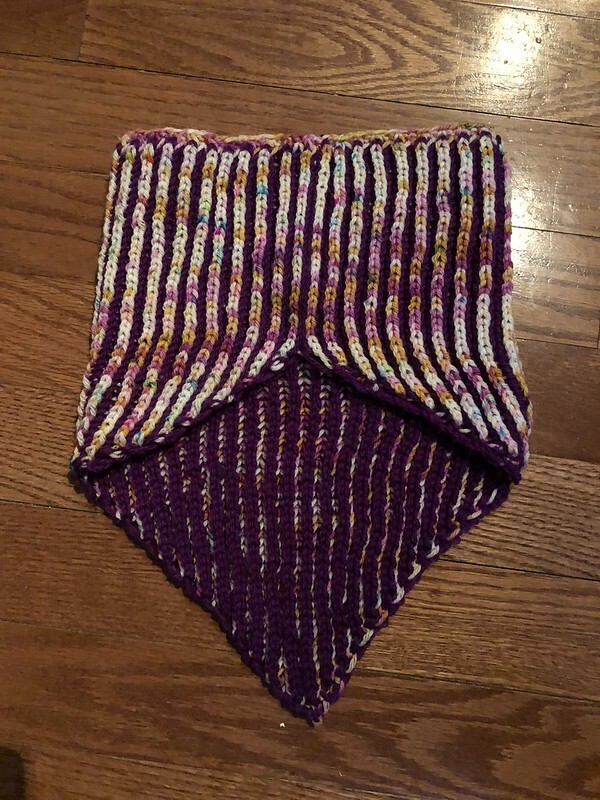 Ooooo I love the bandana cowl!!!!!! Very nice stuff you’ve made! Thanks! I love that the color possibilities are endless with brioche. Your brioche work is fantastic but that hat! Ooooh! I love the moody, bluesy, purpleness of that hat! That was all her picking of the yarn but she’s always into blues and purples. Hey I live in Louisville, sadly😢 we no longer have any yarn shops. The shop in Lagrange has become my LYS. I plan to revisit brioche. Love your work, and your two babies. Lucky you, that your hubby has an interest in your knitting and visited the yarn shop.